Yesterday, we announced Azure Data Lake Analytics and Azure Data Lake Store are in public preview. To help you use the Azure Data Lake as productively as possible, we will have a six-part series on different aspects of the Azure Data Lake over the next few days. This is the second blog in the series giving you the details of U-SQL, the new language we introduced for Azure Data Lake Analytics. U-SQL is a language that unifies the benefits of SQL with the expressive power of your own code. U-SQL’s scalable distributed query capability allows you to efficiently analyze data in the store and across relational stores such as Azure SQL Database. This blog post will outline basics of U-SQL. The next post will go into even more details of how to develop using U-SQL. As you approach U-SQL for the first time, you will notice it's a language you’ll be comfortable with from Day One. The syntax is based on T-SQL while it uses C# types as default. This allows you to easily conceptualize how data will be processed while writing queries, and doesn’t scare you with new frameworks or concepts. Essentially, it abstracts the deeper concepts of parallelism and distributed processing so you don’t need to worry about them while writing your queries. You don’t need special programming skills or months of training to be able to deliver. Rather, just a good understanding of SQL and knowledge of C#. U-SQL allows you to process any type of data. From analyzing BotNet attack patterns to security logs and extracting features from images or videos for machine learning, the language enables you to work with any data. 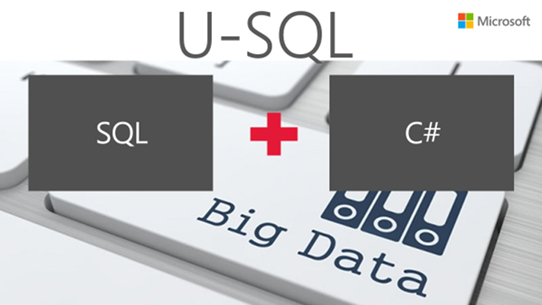 U-SQL integrates custom code seamlessly to allow you to express your complex, often proprietary business algorithms. Different use cases like processing different file types and encryption processes may require custom processing, often not easily expressed in standard query languages, ranging from user-defined functions, to custom input and output formats. This is something that U-SQL excels at. Finally, U-SQL was developed to efficiently scale to any size of data without you focusing on scale-out topologies, plumbing code or limitations of a specific distributed infrastructure. Again, no restriction to the total data size or individual units of data that can be processed and it automatically scales to utilize available resources. Let developers concentrate on business logic to be implemented and not on infrastructure that needs to be setup to process their queries on massive amounts of data. As we see, it extracts a set of fields from a file using a text extractor, which can be customized to suit any format and extensible for any type of data or delimiters etc. To learn more about U-SQL, watch the video below and stay tuned for the next blog post. Read the announcement post more details. Check out the Visual Studio’s U-SQL post to learn more about the new big data language. Visit Azure.com Data Lake solution page. Watch a video about U-SQL. 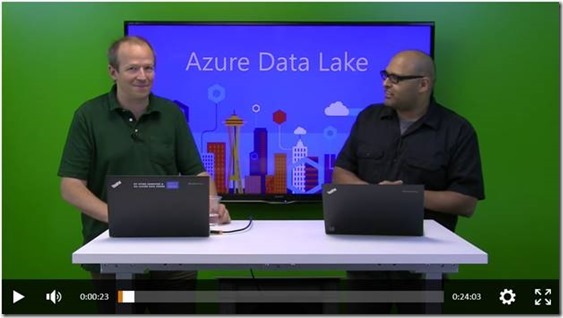 Watch the Azure Data Lake Video Series.